Charles Modlin, Jr., MD, MBA, has a habit of losing sleep over his work. The Cleveland Clinic urologist and kidney transplant surgeon just can’t stop thinking about his second job. He often wakes up at 3AM, fighting to organize a cluster of frenzied ideas, scribbling them down with fervor on a bedside notepad. During these moments of inspiration, he’s fixated on a single idea—a problem he first confronted as a child in rural central Indiana, alongside his father, a man who had sacrificed his senior year of high school to fight for a country that treated him as a second-class citizen. “No one cares about black men,” Modlin’s father told him, perhaps unknowingly pulling back the curtain on a hard truth that would drive his son to accomplish incredible feats. Decades later, Modlin has made remarkable headway toward making that statement one of a past world. But he still wakes up at night, knowing there’s much left to be done. Modlin can rattle off any number of health statistics to support his father’s statement: black men develop and die from prostate cancer twice as often as white men. They have greater rates of hypertension, diabetes, and heart disease, and a four-fold greater incidence of kidney disease, and need for transplantation. Their chances of death from cardiovascular disease are at least 30% greater than that of white men, and they report significantly greater rates of high blood pressure. They often lack access to medical literature, education, healthy foods, and reliable health care. In large part, it was these facts that drove Modlin to create the Minority Men’s Health Fair at the Cleveland Clinic in 2003. But there’s another phenomenon that makes the Health Fair a necessity: many minority populations distrust doctors and the US health care system. Modlin told MD Mag that although the fault of distrust does not solely fall on the modern physician, who is generally willing to serve patients regardless of background, the burden for improving the relationship does sit with doctors. Modlin has accepted this idea as fact, and practices medicine accordingly. “If you don’t have an effective means of engaging or empowering the community to take advantage of screenings and opportunities, you’re not going to be able to have an audience with them to notice the early state of prostate cancer or other conditions,” Modlin said. The annual health fair provides free screenings and consultations to men who attend. Modlin calls it a “friendly portal of entry” to the Cleveland Clinic’s network of care for populations who do not frequently receive medical attention—either due to financial burdens, misconceptions, or general distrust. The barriers minority men have to overcome to receive proper care was evident from the very start of the health fair. Just 35 men attended the event in 2003. But 15 years later, this April, more than 2000 men were screened with the assistance of 400-plus volunteers and representatives from every department at the Clinic. These days, celebrity guests, elected officials, and even Governor John Kasich frequent the annual fair. It has become a critical national program driving improvements in minority-based health, and Modlin is its engine and its trusted figurehead. In addition to the fair, Modlin launched the Cleveland Clinic Minority Men’s Health Center and Center for Health Equity at the clinic’s main campus in 2004. The year-round center falls under the purview of the Glickman Urological and Kidney Institute, serving a specific niche of minority men suffering from urological conditions. It’s a novel service and the first of its kind in the nation. The Cleveland Clinic gave the program the green light because it provided tailored care to a population that needs it, Modlin said. It was named to tailor to patients’ interests, too. The message Modlin’s mission has delivered to minorities seems to have already made big differences in many lives. Modlin has heard from dozens of attendees that they would have never sought care if it were not for the free screenings. But he sees it as having even wider implications that could shape the future of the country. The rate of diversification in the US population projects that by 2050, modern-day minorities will be considered the majority population. As the average African-American lifespan is at least 7 years shorter than the other demographic groups due to conditions often brought on by genetics and biologic makeup, Modlin envisions lasting effects on the future of national health, productivity, and even security. 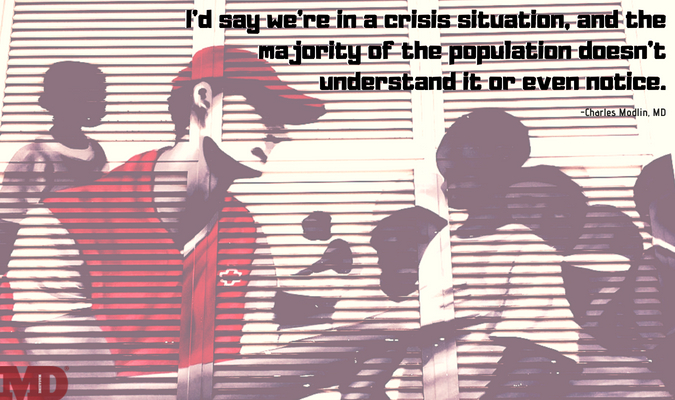 “I’d say we’re in a crisis situation, and the majority of the population doesn’t understand it or even notice,” Modlin said. Indeed, the problem is one that hides in plain sight. Modlin did not hear the phrase ‘health disparity’ while completing undergraduate medical courses from Northwestern University in the 1980s. He didn’t hear it at his six-year urological residency at New York University. 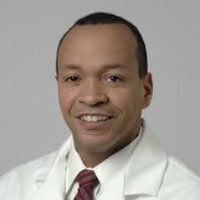 He was finishing his three-year Cleveland Clinic kidney transplantation surgery fellowship in 1996 when it first entered his vernacular. By that time, it had become a national discussion. The “Healthy People 2000” initiative, launched by the Department of Health and Human Services in 1990, implemented proposals aimed at improving rates of health promotion, protection, and preventive care among underserved population groups. Modlin recalls reading about the national strategy, and being shocked at the obstacles minorities faced in not just improving overall health—but in reaching a similar health status to white Americans. In a moment of fortuitous reflection, he looked at his surroundings. In the late 1990s, there were no programs at the Cleveland Clinic dedicated to minorities. What better place to host such a program, Modlin thought, than one that treats every one of its employees equally as care providers? He stared at postcards from 1960s Indiana—a brief ride away from his childhood home—that showed people enjoying picnic lunches while lynchings carried on behind them. He considered including postcards in his pitch for a minority care center—they would mark Exhibit ‘A’ in the host of evidence supporting the concept that minority groups struggle with trusting the healthcare system, and that the gap must be bridged somehow. A friend talked him out of it, but the images, like his father’s words, were unforgettable. In June 2005 the US Food and Drug Administration approved isosorbide dinitrate/hydralazine (BiDil) as the first marketed therapy designated for a specific race in the US. The combination drug is indicated for the treatment of congestive heart failure in African American patients. While debate broke out on the merit of clinical practices which led to the race-specific indication, Modlin saw a pharmaceutical company finally address genetic disparities in an honest way. He knew from his own practice that different races present different trends in metabolism, or in the case of kidney transplantation patients, differing needs in immunosuppressive therapy. There hasn’t been much progress since BiDil. Most clinical trials for investigative therapies involve a predominately-white patient population, Modlin said, and little-to-no consideration is given to racial disparities in treatment efficacy and safety. He calls on pharmaceutical companies to begin addressing this gap, and for researchers to stratify analysis with consideration to the pathogenesis or causes of disparities. As for the issue of patient trust, physicians must do more. The simplest misunderstandings—a well-meaning and invested patient missing a check-up because of financial constraints, for example—can lead to doctors unknowingly perpetuating stigma surrounding minority communities. Modlin pointed to the opioid crisis and its prevalence in urban communities, which has resulted in clinical studies showing that a black patient is far less likely to be prescribed pain medication for a serious injury than a white patient. “The onus is on us to develop alternative ways to communicate with people, engage with people, empower people, and respect that in many instances people have cultural differences,” Modlin said. The public rhetoric has become too reactive, and too willing to fixate on just one issue before moving on to the next, Modlin said. What’s missing is an emphasis on preventive care, and education on how the conditions harming minority communities the most are connected. Getting men to come to his fair has been one of Modlin’s great successes. Now he plans to send them home with a message. After his military service, Modlin’s father never finished his high school degree. His mother returned to school at 40 to earn a teaching degree. Education was not a necessity to Modlin’s parents—it was a privilege. When he became the first man in his family to graduate high school, he was reminded of what that accomplishment really meant. “My father always taught me that it’s my responsibility to use my education to give back to the community, because whatever I do, I’m not a product of only my efforts—there were people who made sacrifices before me,” Modlin said. Having been a doctor now for a quarter-century, Modlin’s learned too much to accept health disparities as anything other than a feature baked into the American care system. He has a clear vision for the plan that could tackle the issue in a way that Healthy People 2000 and its successors have not. The plan calls for multiple levels of intervention, from health care providers, to community leaders and the pharmaceutical industry. It’ll take celebrity voices, educational outreach, an adoption of Cleveland Clinic’s “everyone is a provider” adage, and an unwavering willingness to challenge the norm. It’ll also take a national leader. Modlin is vying tirelessly for the job, no matter how many sleepless nights might result. “We all have a responsibility to take care of our families and communities,” Modlin said.